As customers move toward their goal of 100% virtualized data centers, they increasingly look for ways to bring the benefits of VMware virtualization to their mission-critical Microsoft applications. Customers planning a new deployment, performing an upgrade, or planning to entirely virtualize their data centers have an ideal opportunity to transition to a VMware virtual infrastructure built on NetApp unified storage. 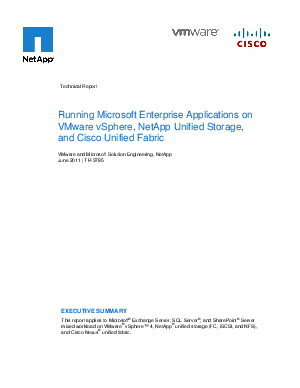 This document provides guidance on how to design and architect a scalable Microsoft applications mixed workload solution using highly available VMware virtual infrastructure and NetApp unified storage. It highlights the flexibility of leveraging either a Fibre Channel (FC) protocol-based storage solution or IP-based solution (that is, iSCSI and Network File System [NFS]) for hosting virtual machines. It also describes the NetApp backup and recovery solution for the Microsoft applications. All the FC, iSCSI, and NFS-based solutions are applicable for all enterprise types (large, midsize, and SMB) and can be scaled up or down based on business requirements.